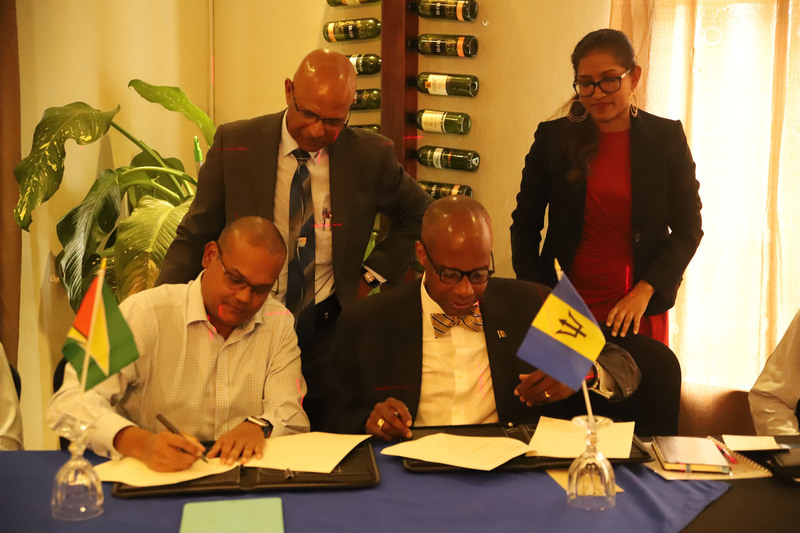 The Guyana and Barbados Stock Exchanges on Friday signed a Memorandum of Cooperation (MoC) and Minister of Finance Winston Jordan said he hoped the alliance will lead to local financial literacy being improved. “Financial literacy is important to the proper functioning and intermediation of the financial system. There is no doubt that financially-literate businesses will choose to lower the cost of borrowing by issuing shares, and investors with a high level of financial literacy will diversify their investment portfolio by purchasing shares in profitable businesses,” Jordan told attendees at the signing of the MoC, which was held at Herdmanston Lodge, in Georgetown. He urged the Guyana Association of Securities Companies and Intermediaries (GASCI), which was Guyana’s signatory to the agreement, to find ways of narrowing the financial literacy deficit in Guyana. He said that with support from his government, he believes that it can be done through “undertaking a financial literacy programme to ensure that Guyanese in the near and far reaches of the country are made aware of the benefits of participating in the local stock market.”….